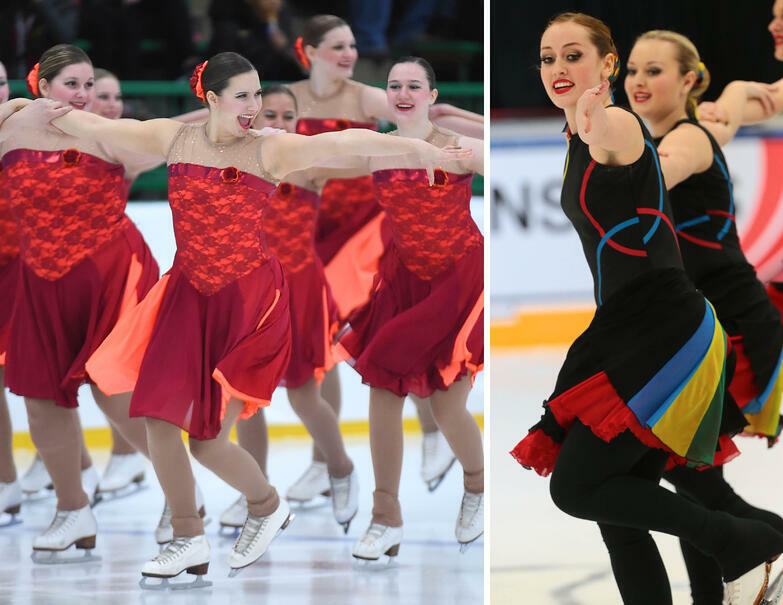 The 2016-2017 Synchronized skating season is starting to heat up, and odds you are planning for your team's theme, choreography, and (our favorite part) skate dresses! We took a look at this season's skate fashions to find style inspiration, and pulled together 6 of our favorite trends for skating dresses. 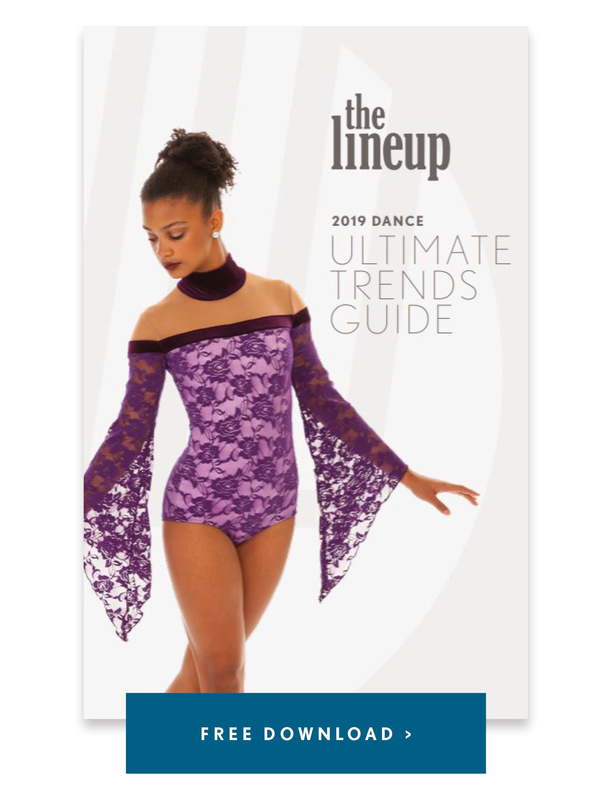 This trend is something you truly want to see on the ice for the full effect, and the Synchro Panache Intermediate dress (below) is a great example. What seemed like just another gorgeous skate dress on the rack, was completely transformed when the team turned on the ice. The side slit that revealed the underskirt created a bold flash of color, emphasizing their movements. Another great way to add a pop of color? A fishtail, which adds a triangle of color to the center back skirt, like Capitol Ice Chip's Olympic theme dress, below. Left: Synchro Panache Intermediate Team in a custom skate dress. Right: : Capitol Ice Chips Intermediate Team in a custom Olympic theme skate dress. Sublimated skate dresses have been gaining popularity for one very great reason: design possibilities. You can print your own pattern or design directly onto fabric with sublimation, which makes all kinds of crazy ideas possible. The new twist? Sublimate on mesh, to create a sheer and edgy look. An open front top layer: perfect for a little flutter in front as you gain speed on the ice! A shorter underskirt: paired with a gathered and full circle top-skirt, this look look reaches maximum effect during spins! Do you remember Team Canada's black tights at the Synchro World Championships in 2013? This is where we first saw this bold look, and it has been gaining popularity ever since. The trends adds drama, and emphases leg movements because the color contrasts well with the ice. Avoid visually chopping up the leg by pairing black tights or over-the-boot leggings with a black skirt, which will create one continuous line. 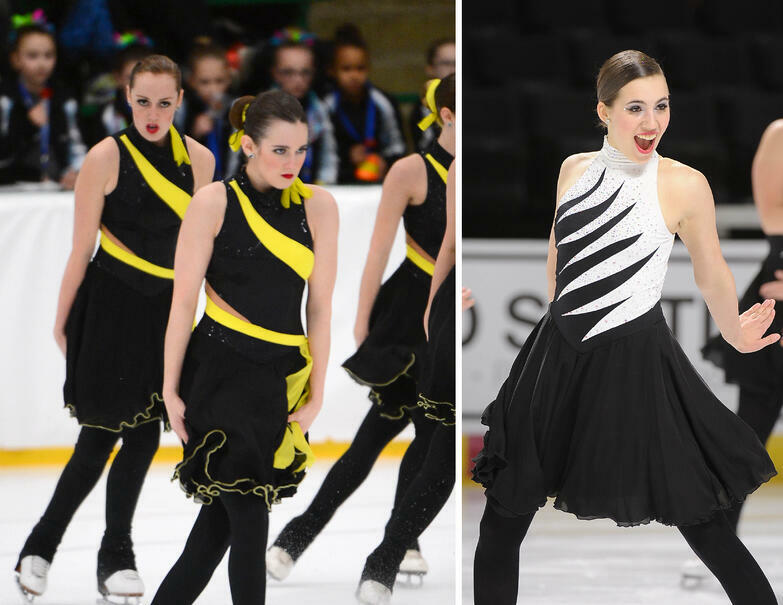 Left: Capitol Ice Chips Intermediate in a custom skate dress. Right: St. Louis Synergy Junior team in a "Hot & Cold" theme custom skate dress. The high waistline is a staple in most fashion runways these days, and the Synchronized Skating world is no different. Our favorite way of achieving this look? Add a belted waistband to your dress to emphasize and flatter the feminine figure. Styles: Emerson Skate, Warrior Skate, and Captain Skate. Skaters always seem to know how to exude a feminine grace, even when they have an edgy theme. Take the Miami University Senior Team and their "Evil Queen" short program, for example. Their dress is the perfect combination of dark and elegant. So how did they get this look? The magic formula pairs elements from both ends of the spectrum: both edgy and feminine. Here, dark and metallic colors works well with lace and sparkling rhinestones. Left: University of Michigan CollegiateTeam in a Beetlejuice theme custom skate dress. Right: Miami University Senior Team in an "Evil Queen" custom skate dress. So what do you think? Is your team ready to take on any of these trends? Let us know your favorite trend!